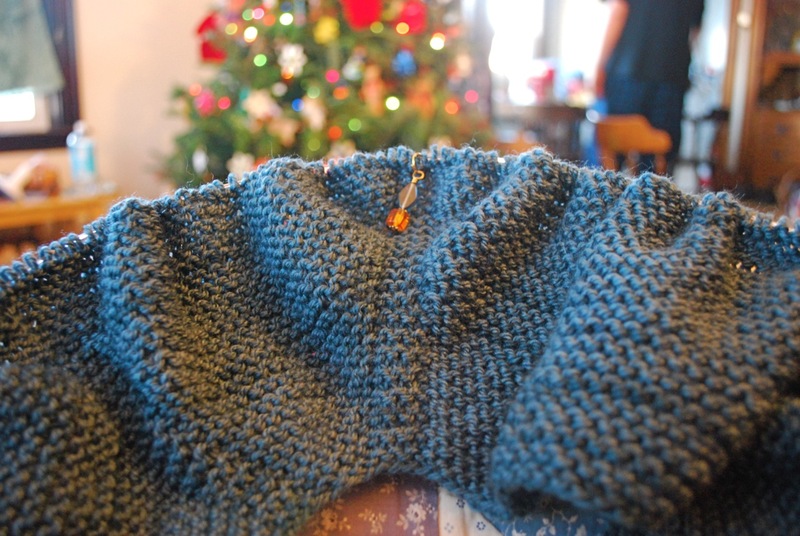 Several weeks ago I made a promise that when the holiday knitting was under control, I would knit something for myself. Over the weekend I made good on that promise. 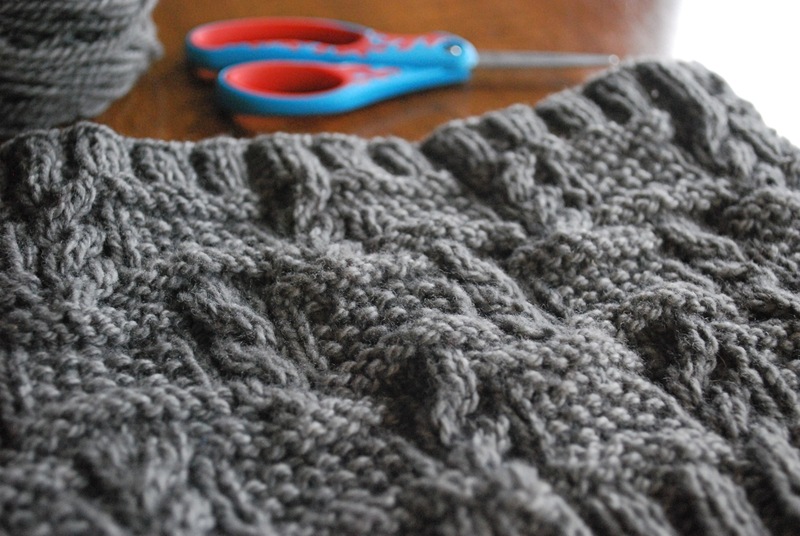 There's a new sweater in the works - Grayling. When I started this project, I had several modification ideas. Sometimes that's a disaster waiting to happen. After all, I don't completely rewrite a new recipe until I've tried it first. In the end I compromised and settled on three minor adjustments. Now that I've started a new project, I don't want to work on anything else. But it's New Year's Eve, and my goal is to start the new year with a shipshape office. That means decluttering, filing papers, counting yarn, bookkeeping. If I were more ambitious, I would tackle the whole house but living with teenagers has taught me to pick and choose my battles carefully. I'll settle for organizing my own space. I'm off to sift and sort small pieces of paper and make sense of them all. Here's to peace and positive energy in 2013! 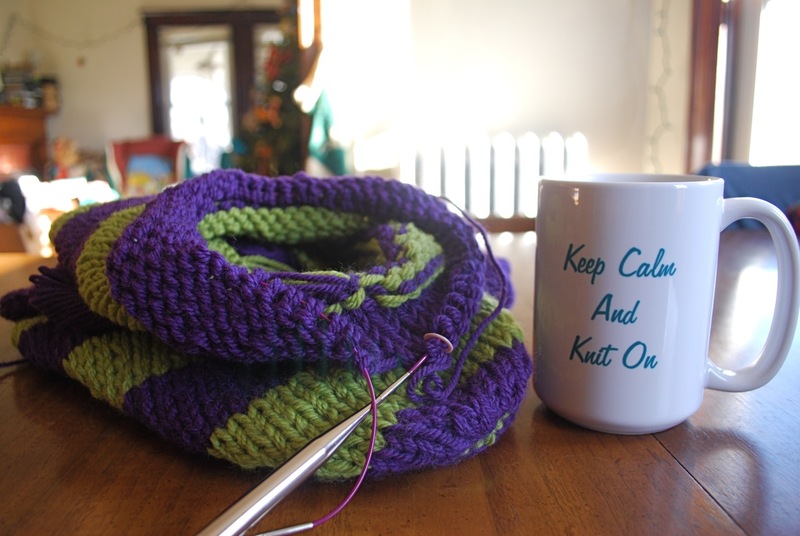 Knitting holiday gifts can be hectic. 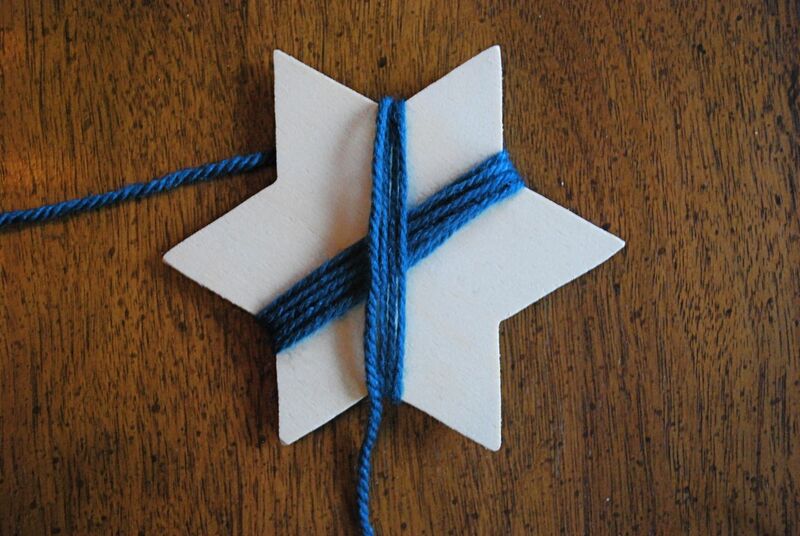 It seems there's always a mad dash to finish one project just so you can cast on the next one. There's not enough time to savor the knitting details and nuances. 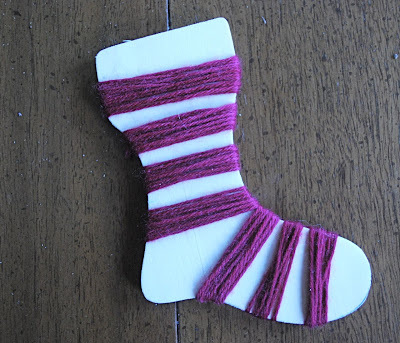 In the midst of my holiday knitting I was thrilled to finish the Felted Clogs, but I was sad to see one project come to an end. This is Brooklet under construction. I'll admit that the stockinette section was a slow go. I should have parked myself in front of a good movie, but instead I was knitting this on-the-go and it didn't seem to move along quickly enough. But once I hit the lace, the pace picked up. The lace pattern was easy to memorize. Unlike most lace repeats this one could be worked at knit night and other social settings. I checked the length of the lace section a couple of times. 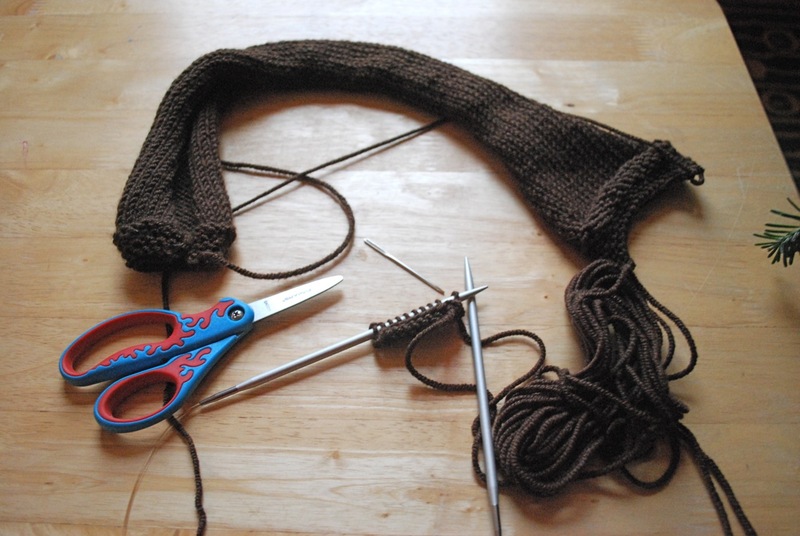 It had to be the same length as the stockinette section - not shorter and not longer. 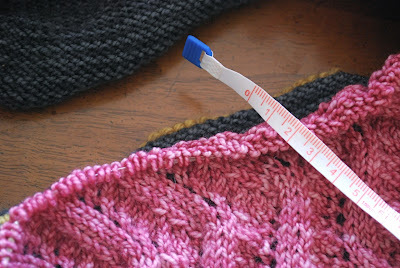 As I closed in on my goal, I realized it was going to be hard to get an accurate measurement with the curled stockinette edge. At this point I decided the provisional cast on at the edge of the stockinette had to go. 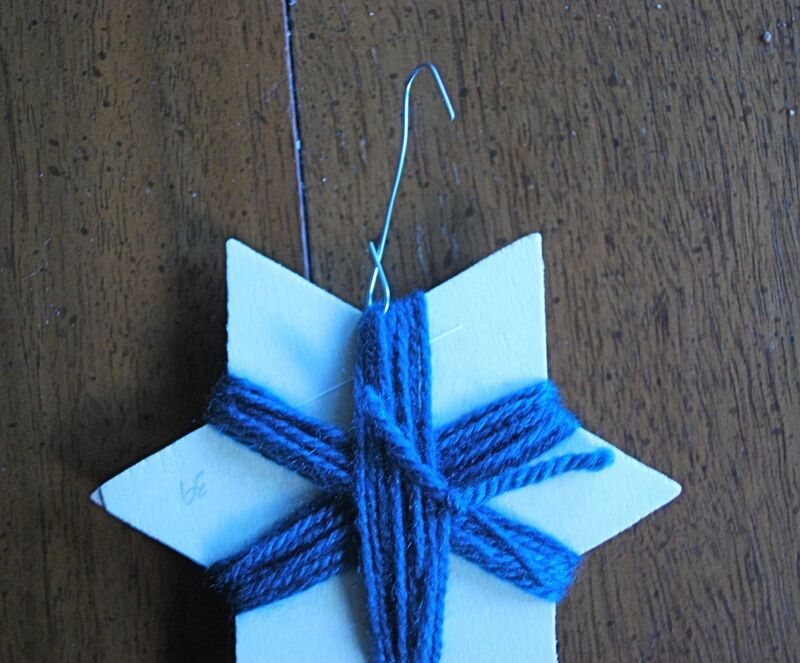 I removed the waste yarn stitch by stitch. With two sets of stitches on cables it was much easier to measure. A perfect match. 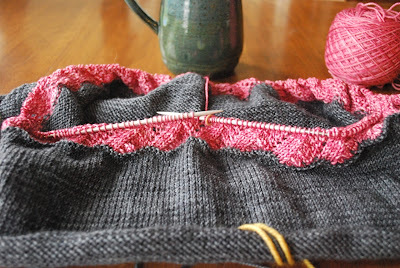 The project was finished with a neat and tidy three needle bind off. I had just enough time for a quick bath and a good blocking. Ready to wrap. My daughter requested this in Lillian Pumice and Desert Rose - her current colors of choice. 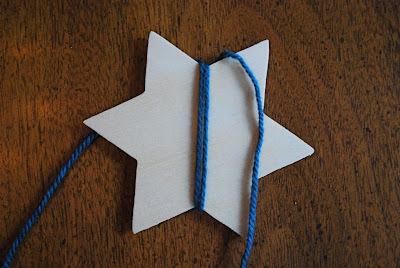 I had fun with this project and am mulling over the idea of making one for myself. Since I have other projects waiting in the wings, for now I'll add it to my list. Over the last few weeks we've accumulated a growing collection of pine cones. Family members pick them up and bring them home to add to the pile. 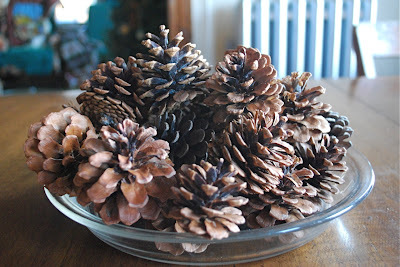 They are appropriate for the season and are my color inspiration for the week. We had a quiet, relaxed holiday celebration with family and friends. As usual there was plenty - food, drink, sweets. Watching movies, knitting, playing new games - a day without a schedule. After all the busyness leading up to the holiday, the day after reminds me of a big balloon that's been deflated. Whoosh. There is work to be done, and I'm trying to get my bearings. On days like today I'm glad I'm my own boss. I can gradually ease back into the normal routine. As part of that transition, finishing up the last pair of Felted Clogs is at the top of today's list. When I woke up this morning, I had to think long and hard to figure out what day of the week it is. There have been too many late nights. The month is a blur of birthday parties and holiday celebrations. And somehow we landed on the holiday week. We've baked and gifted dozens of cookies. We've embraced the darkness and welcomed the coming light. After all that, there's still plenty of work. It's a busy day ahead - from casting off to cooking to wrapping. I have plenty of helping hands, and there's a sigh of relief in knowing it will all get done. Holiday cheer to all who celebrate! May your festivities be merry and bright. 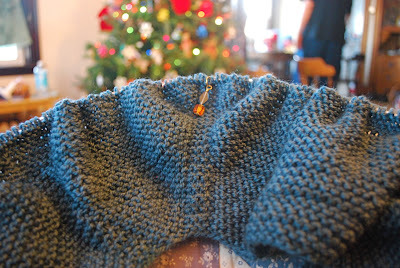 I'm at the point in my holiday knitting where I have good progress on most of my projects. I just need to pull everything together and put on the finishing touches. I'm hoping that the weekend ahead holds plenty of uninterrupted, productive time. A couple of the projects are in pieces - like this one. Girlfriend Gift. This is a sweet little headband. The main part is finished, and I'm working on the decorative band. Then with a little bit of assembly, it will be ready to gift. This pattern boasts that it's a 2-hour project. While I think it takes a little more than 2 hours, it is pretty quick. And that's a good thing because I have to make another one. 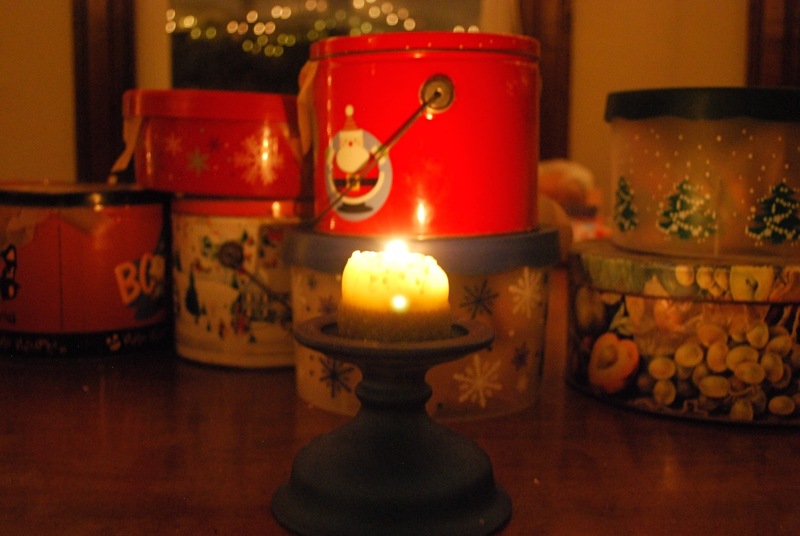 Today we celebrate the winter solstice. The darkness has gradually been wrapping itself around us for weeks. 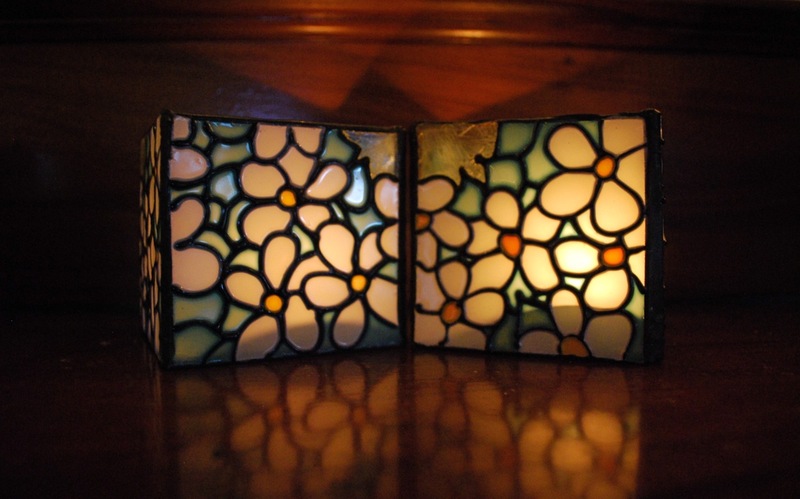 Light is scarce, and I burn candles for a glimmer of brightness. My color inspiration for the week. 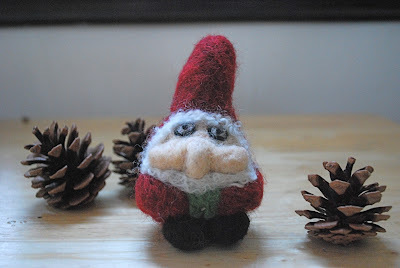 I've noticed that my holiday spirit has been lagging. Holiday music and movies have helped a little, but I can't seem to wholeheartedly immerse myself in holiday preparations. I've delegated tasks, and the kids are pulling their fair share. They're baking cookies. We won't discuss the fact that they're eating them as fast as they're baking them. They secured a tree. It's still outside, but plans are afoot to set it up and decorate it. 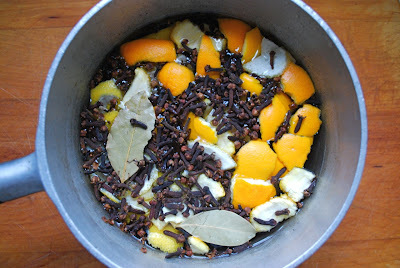 Then my son suggested we needed a pot of the smelly stuff. And he was right. 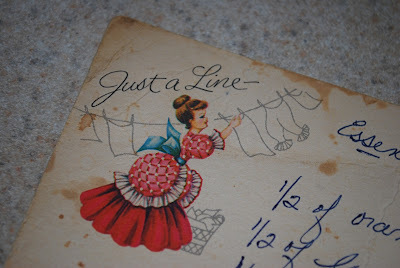 Essence of Christmas - from my mother's recipe box, written on a vintage note card. 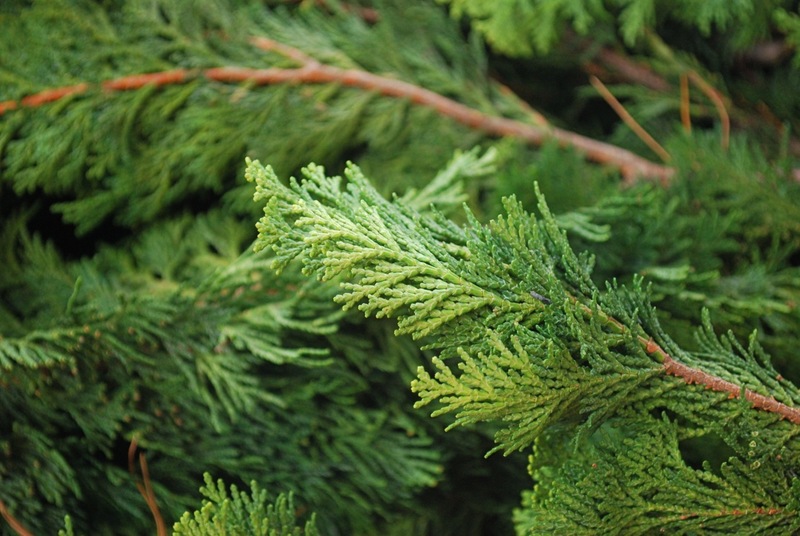 When my kids were little, they called this concoction the smelly stuff. In the days leading up to the holidays, I always had a pot of it simmering on the stove. 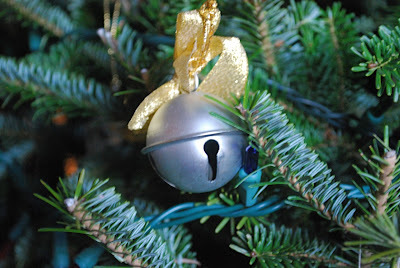 It heralded the coming holidays. The other day when my son suggested that we needed the smelly stuff, I helped him make a batch. Cut up orange peel and lemon peel. This is the peel from 1 lemon and 1 1/2 oranges. 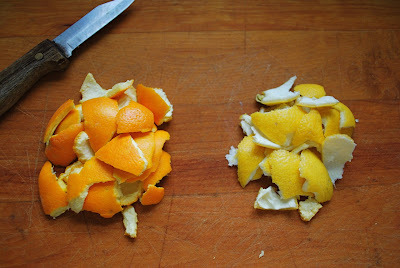 I usually use a little more orange peel than lemon peel, but I don't think it really matters. 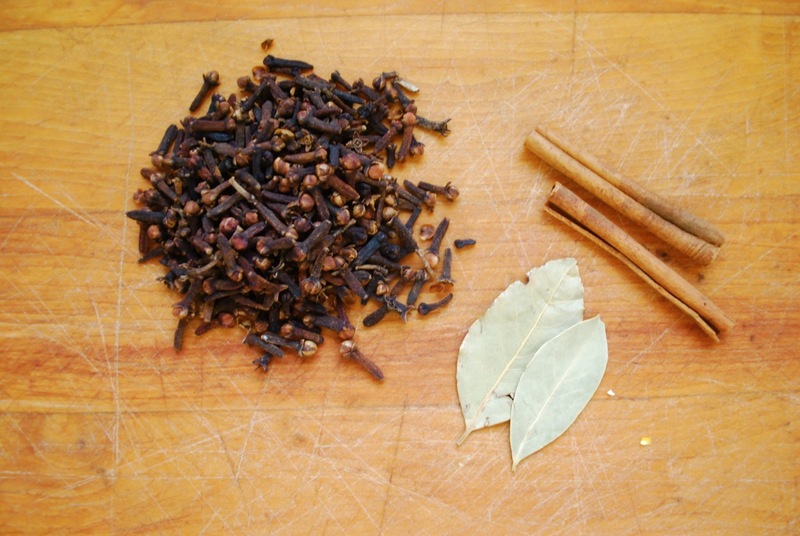 Gather 2 bay leaves, 1/4 cup whole cloves and a couple of cinnamon sticks. If you have longer cinnamon sticks, one will do. Put it all in a small pot. Add water and place it on the stove. Simmer on low. Savor the smell. Add water as needed. After hours and hours of simmering, it will lose its smell. Make a fresh batch. Holiday spirit in a pot. I think most knitters will agree that not every knitting project is fun from start to finish. 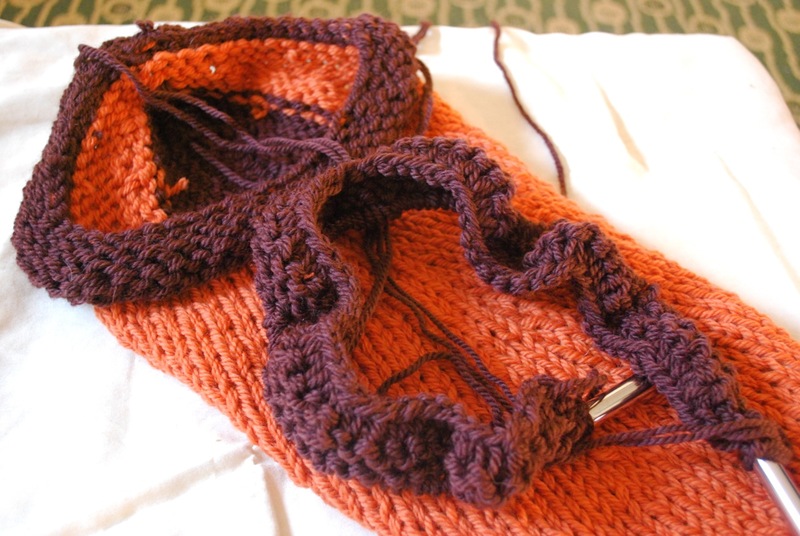 Sure, some projects are a blast from the cast on to the bind off, but most don't fall into that category. Instead, many projects have a section that you have to slog through - that section of monotonous ribbing or endless garter. The tedious part can be anywhere in the design, but once you get to the other side, the project is miraculously full of life again. You can't imagine how you ever found the project boring, and you zip along to the finish line. My current project (Brooklet, in case you were wondering) got off to a sluggish start. All stockinette - over 260 stitches for over 6 inches. There's something to be said for mindless knitting, but when I'm on a deadline I want interesting knitting so I don't dwell on the deadline. 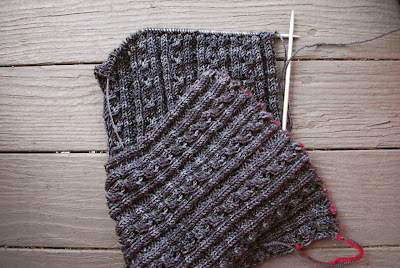 Now I'm a fan of gray, but this is my second project in a week with this particular shade (Lillian Pumice). Add to that the weather for the past several days has also been gray. I was craving a bit of color. 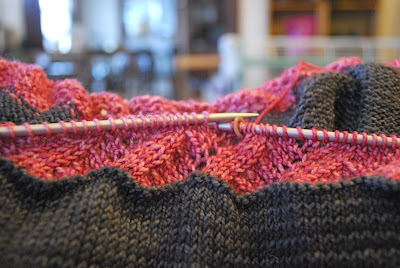 And once I got past the stockinette, I was rewarded with some color. Cheery pink and a lace motif. My spirits are revived. Let the fun begin. All That's Left . . .
Knitting. Knitting, knitting and more knitting. What little shopping I had to do is checked off my list. 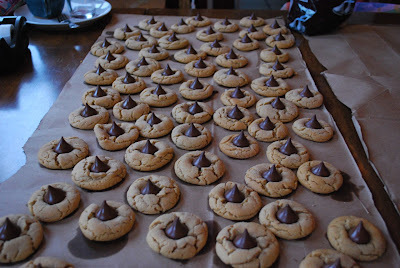 There's still plenty of baking and wrapping, but I can enlist help from the troops with those tasks. This is a knitting weekend. I'm curling up on the couch in my office and catching up on podcasts, movies and my audio book. Since I'm well on my way with this pair of Felted Clogs, I'm thinking ahead to the next project. This is waiting in the wings - my weekend work. Over the years I've gradually left more and more of the holiday decorating to others in the family. 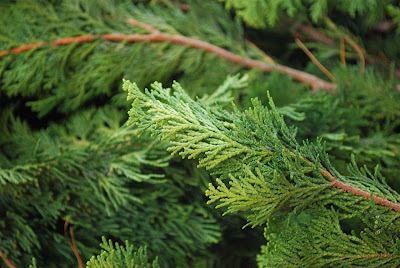 This year there are plans for making a wreath or two, and some of the materials have been collected. My color inspiration for the week. This time of year is full of creativity, ideas and inspiration. Everywhere I look people are making - knitting, sewing, crafting, baking, cooking. 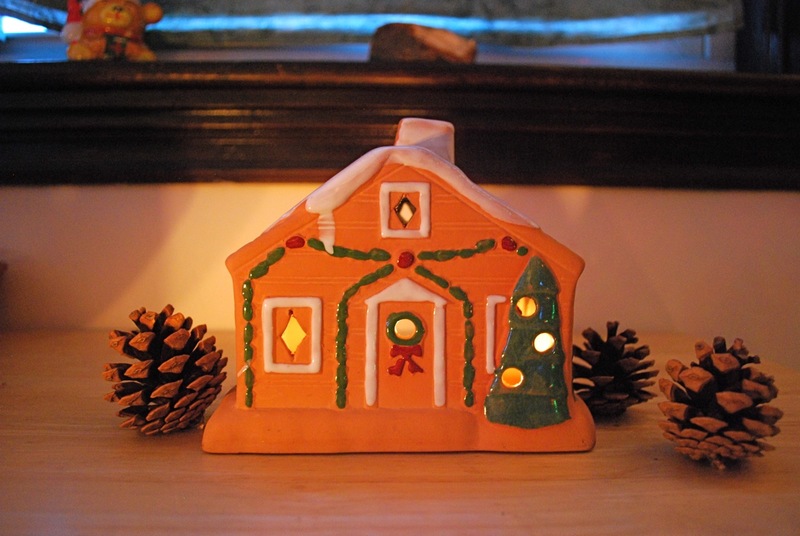 I do a fair share of making all year long and add special, traditional items at the holidays. This year I decided to expand my horizons and make at least one new holiday item. I considered several things and finally settled on this ornament idea from Susan Gibbs. Instead of making my own wooden cutouts, I went to the local craft store. 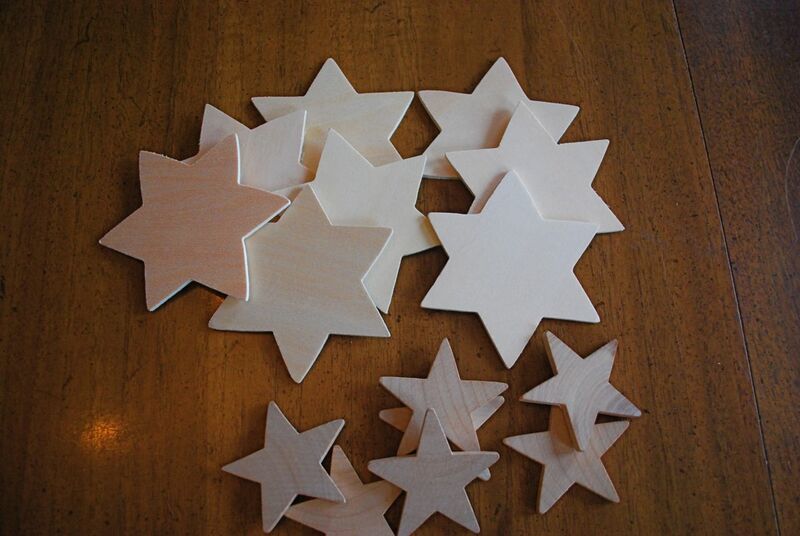 I came home with wooden stars. 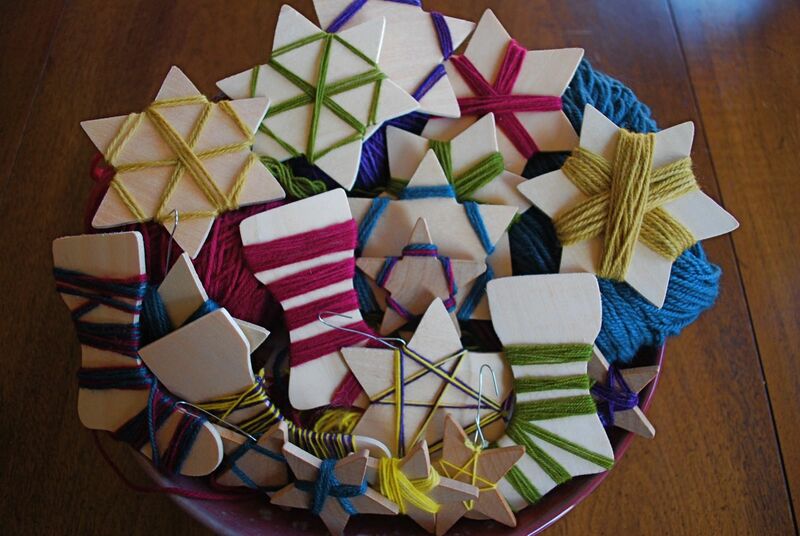 I grabbed some yarn and began wrapping. I knotted the two ends together on the back side and attached an ornament hook. A little light bulb went on. I realized the possibilities and made another trip to the craft store. A sock - with stripes, of course. It didn't take long for the kids to join in the fun. 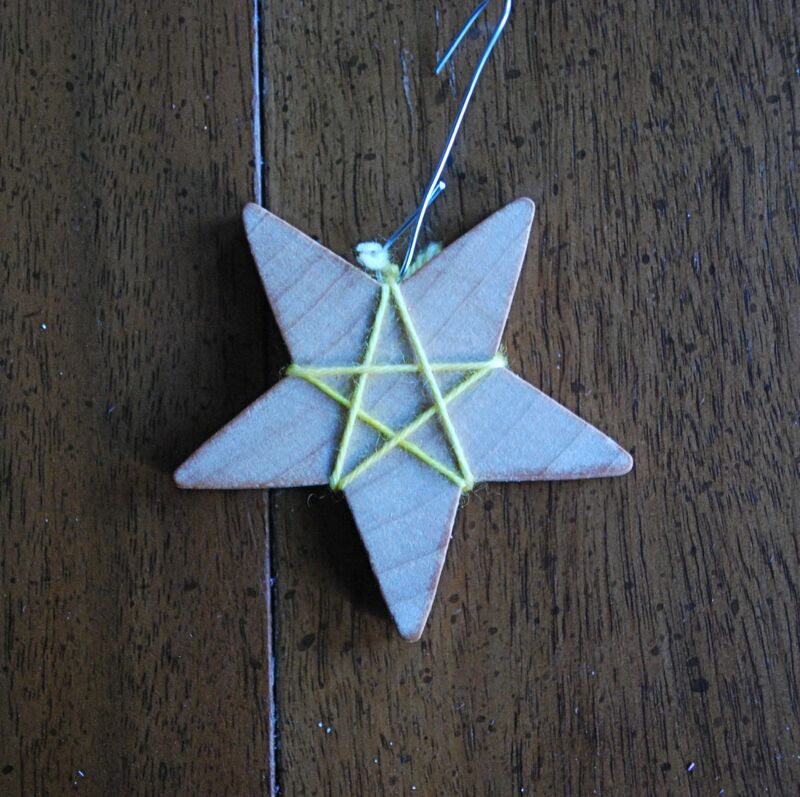 A star within a star. Before we knew it, we had a pile - more than enough. Now all we need is a tree to go with the new ornaments. It's Monday morning, and I'm back at it after a successful birthday weekend for my daughter. The requested Soft Cables Moebius. 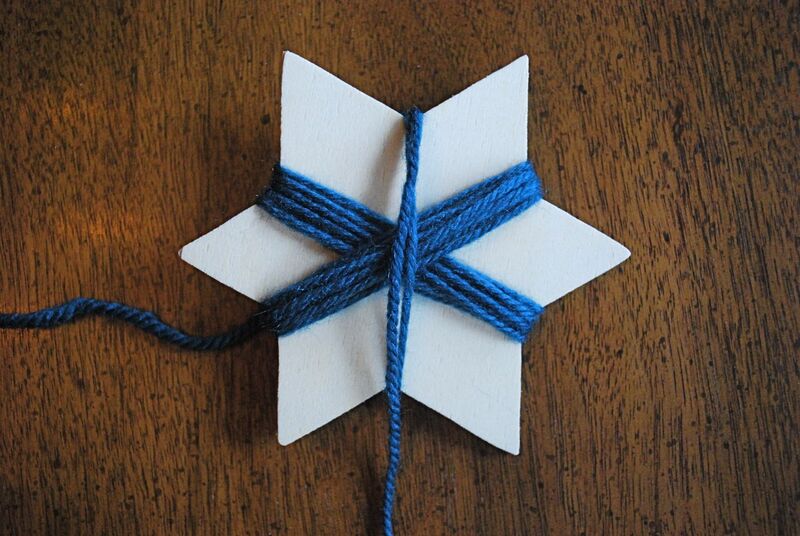 When I was wrapping my daughter's gifts, I thought I might have to wrap this one with the needles. 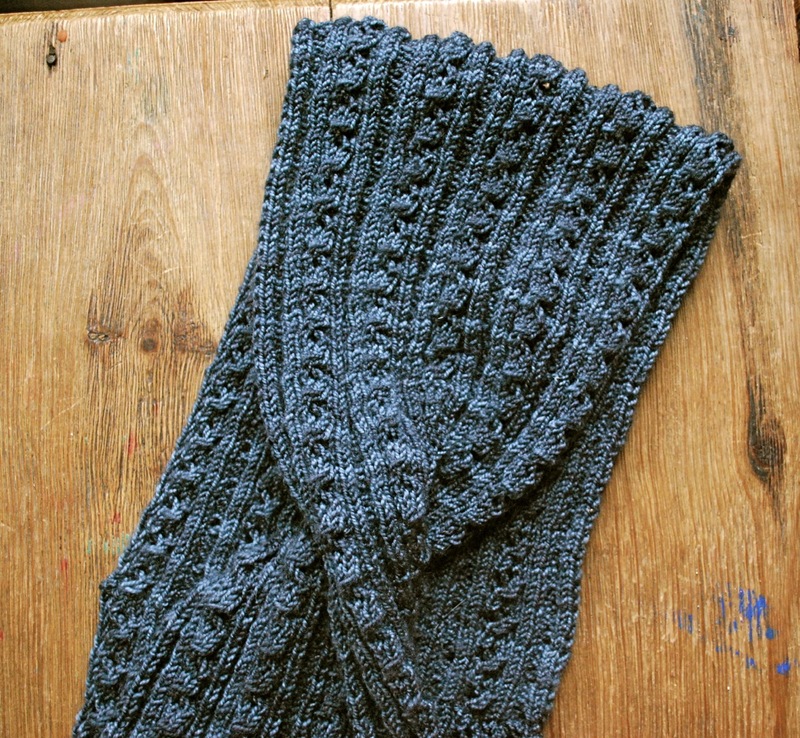 Somehow I was able to buy a little time, finish and wrap it without the needles - always a bonus when gifting handknits. Just this morning I realized that the name of this pattern is slightly misleading. There aren't any cables. 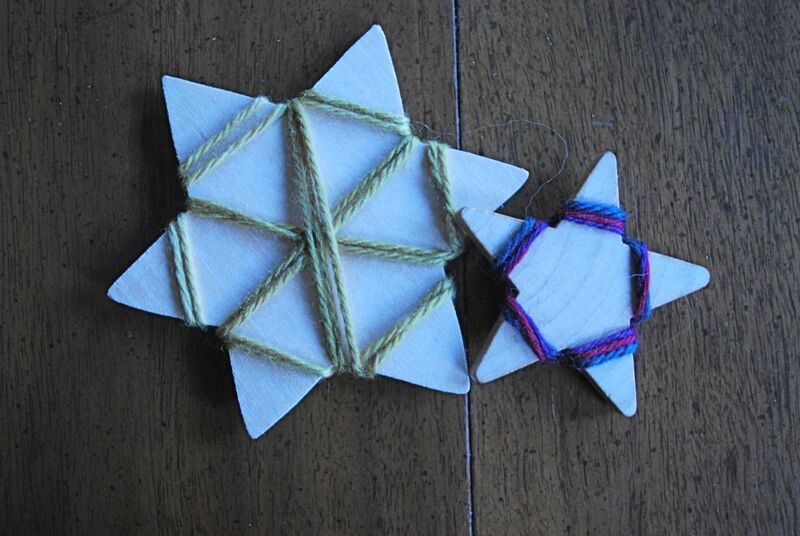 Instead the design uses purl 3 together to create a twisted, cabley effect. 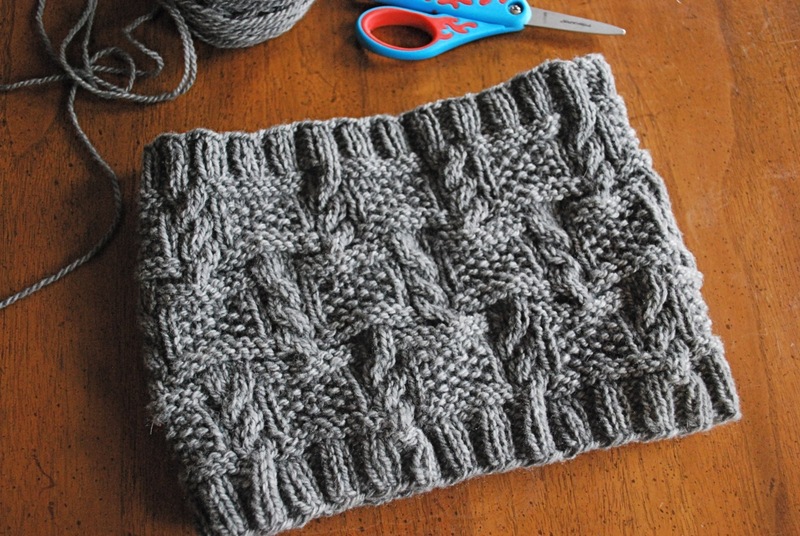 While this pattern doesn't have cables, it does have a moebius which is added at the very end. 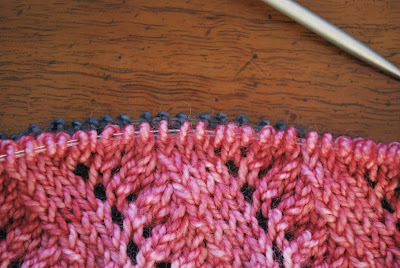 The cowl starts with a provisional cast on. Once it's knit to the desired length, the fabric is twisted and joined with either a 3 needle bind off or grafting. I chose the grafting method. The yarn is Dirty Water DyeWorks Lillian, colorway Pumice. This yarn has a lot of spring and bounce making for a squishy cowl. Upon opening this gift my daughter paid me the highest compliment. "Oh, you made it for me. When did you knit this?" It's encouraging to know that I can still pull off stealth knitting, especially this time of year. This has been one of those weeks. Monday felt like Wednesday. By the time Wednesday rolled around, I was convinced it was Friday. Now that Friday is finally here, I'm terribly confused. Since the knitting elves are nowhere to be found, I've been staying up extra late and getting up extra early. It may be wearing on me just a tad. The only attention my holiday knitting list has been getting is that I added a couple things to it. I convinced myself this is acceptable because I only added "small" items. Before I can even pick up needles for holiday knitting, I have to finish this. Birthday knitting. 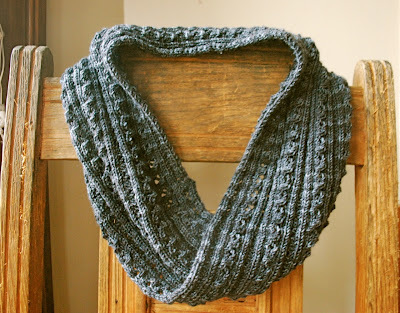 My daughter's birthday is this weekend, and she specifically requested this cowl and this yarn. 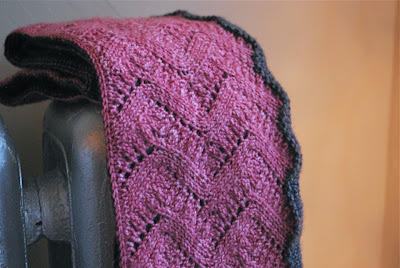 Soft Cables Moebius in Lillian, colorway Pumice. All mothers make sacrifices for their children. Knitting is one of my sacrifices. Before we head into the weekend a PSA for NYS Sheep and Wool Festival aka Rhinebeck. Show merchandise at Rhinebeck often sells out. This year the hardworking event planners have reordered and restocked their online shop. Quantities are limited, so don't delay in placing your order. I never tire of earth tones - so basic and subtle. In the fall I look at dry leaves, and in my head I hear them. My color inspiration for the week. I can usually tell what season we're in by the condition of my hands. These days my hands are extremely dry and cracked. It must be winter. With all the dyeing I do my hands are exposed to a lot of water, and water makes a bad situation worse. 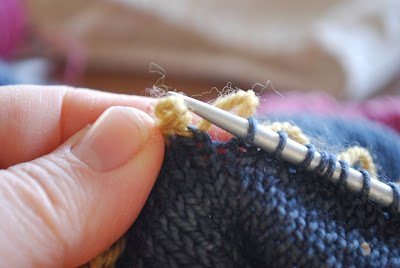 I know the situation is really bad if I pick up a skein of yarn, and the yarn snags on my cracked fingers. This fall I decided to conduct a little experiment. 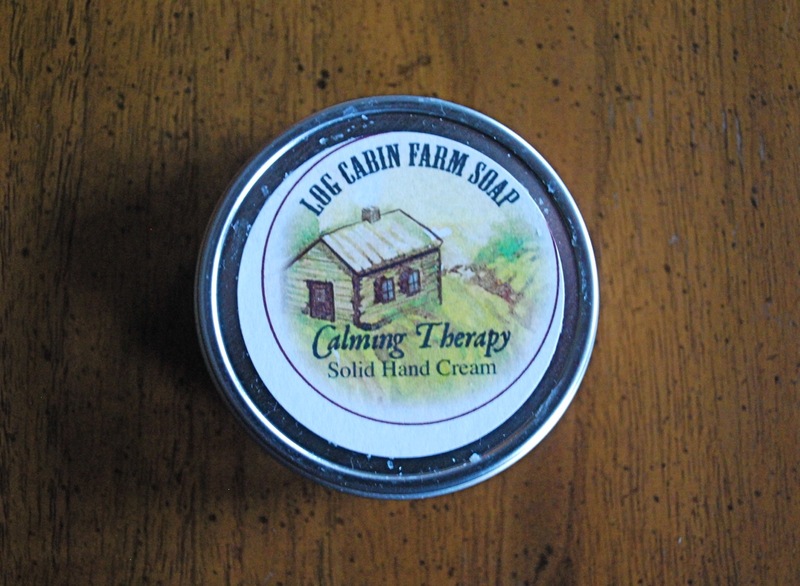 When I was out on the fall fiber festival circuit, I picked up a few hand products. There are a lot of interesting hand helpers out there - some more well known than others. Over the last few days I've been sampling them, and I thought I would share my findings. Let me start with my faithful, tried-and-true remedy for severe cracks. This is a product I've used for many years. 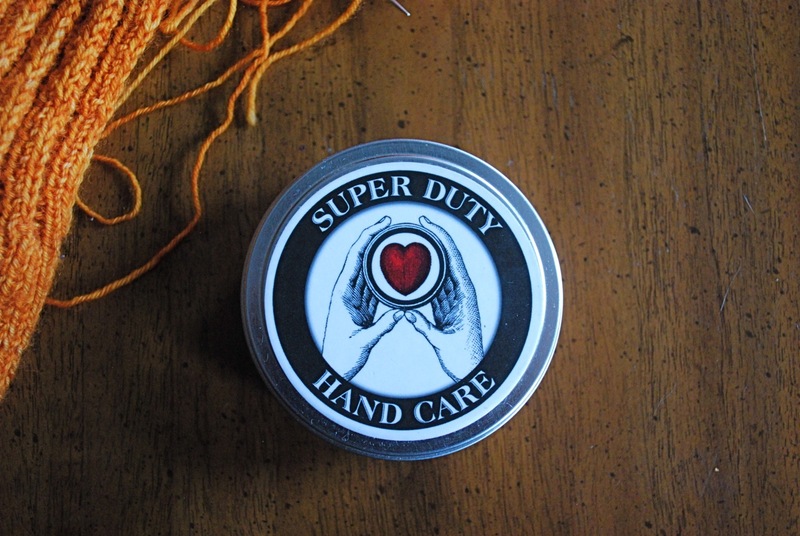 Super Duty Hand Care from Sweet Grass Farm. Super Duty works like a charm, especially on hard-to-heal cracks. It comes in a cake that you rub on your hands like a bar of soap. I usually apply extra to the deeper cracks I get around my fingertips. Super Duty works best if left to soak in and is especially effective if put on before bed. Sweet Grass Farm has expanded their product line from back in the day when I first discovered them. I especially like their soy candles. In my wanderings this fall I picked up this little tin. Calming Therapy from Log Cabin Farm Soap. This product comes in cake form. It's not as heavy as Super Duty, so I didn't feel the need to let it soak in. It's available in a variety of scents or unscented. I don't think it's quite up to the challenge of my deep cracks, but it has a nice, overall smooth feel. Just last month I was delighted to discover Long Island Livestock Co. Actually I had a little help from a friend who pointed me in the right direction. 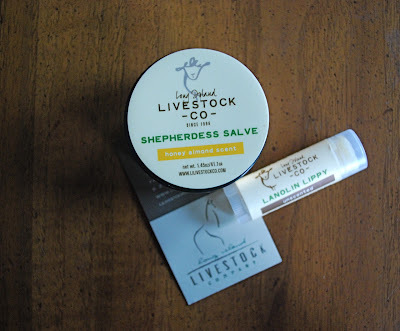 Shepherdess Salve. This product comes as a thick paste - a good solution for my hard-to-heal cracks. It's so effective that I'm ready to give it a test run on my equally dry and cracked heels. Shepherdess Salve contains lanolin and smells like it. I love the smell of lanolin, but if you have an aversion, this might not be the product for you. They also have a lip balm - Lanolin Lippy. As the name suggests this is also heavy on the lanolin. Moving on to lotion . . .
Handmaid from Soak. I've been meaning to try this for quite some time and finally snagged a bottle. This lotion rubs right in without feeling greasy. I bought the lacey scent - a light, delicate fragrance. 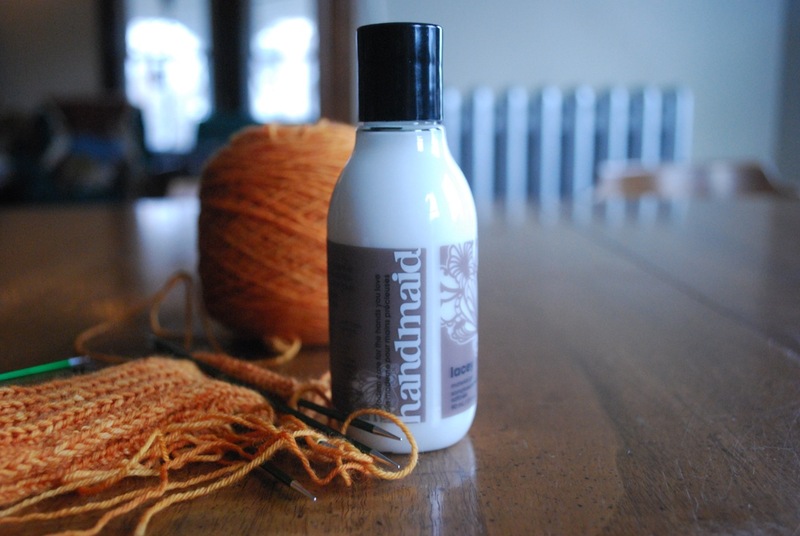 Handmaid is handy if you need a quick something to soften up your hands. Finally, I have to mention a product I discovered a few years ago. Soy Ball. Actually they don't make it in a ball any more, but it is available in bar form. This picture was taken when my ball was new. Now it's nothing more than a little bump that fits in my palm. 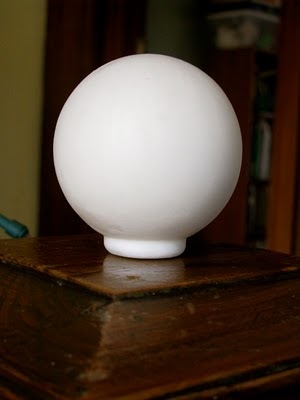 The Soy Ball leaves hands feeling smooth and silky. Again, it's not going to help with stubborn cracks, but it's handy to have and it lasts a long time. I thoroughly enjoyed this little experiment and will continue to keep my eyes open for other hand care solutions. Now I have a variety of products to use, and I'm ready to do battle with the dry, winter days ahead. My to-do list for the weekend included updating a few pages on the website - a simple enough task. Somehow I deluded myself into thinking this would be a quick update, and I completely underestimated the amount of time it would take. In all fairness I did encounter some technical difficulties with my computer. Timing is everything. I knew my computer was on the brink of some issues. I only wish it had waited until after the update to start acting up. I was resourceful and sorted it out, but the bottom line is the update really cut into my weekend knitting time. And this time of year every minute of knitting time counts. On to the good news. 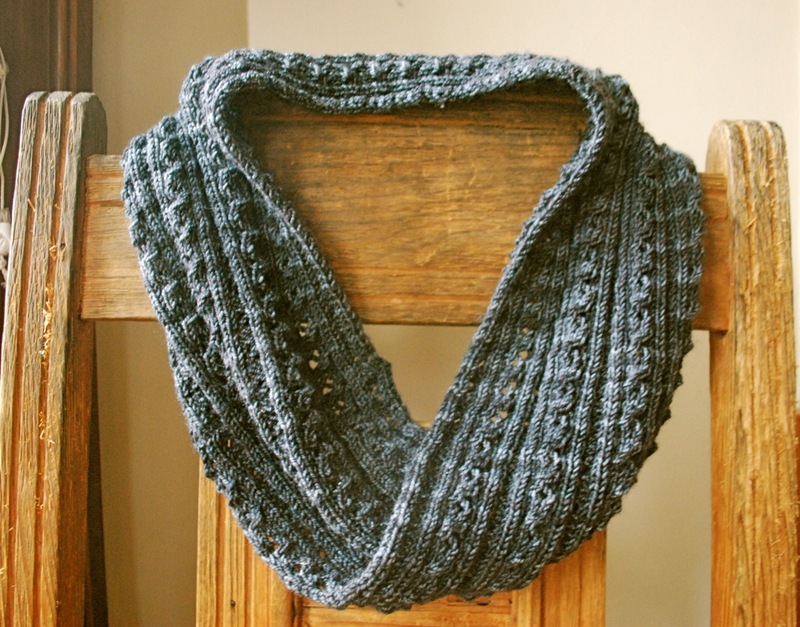 I'm delighted to announce the addition of Clara - a 100% Blue Faced Leicester, worsted weight yarn. 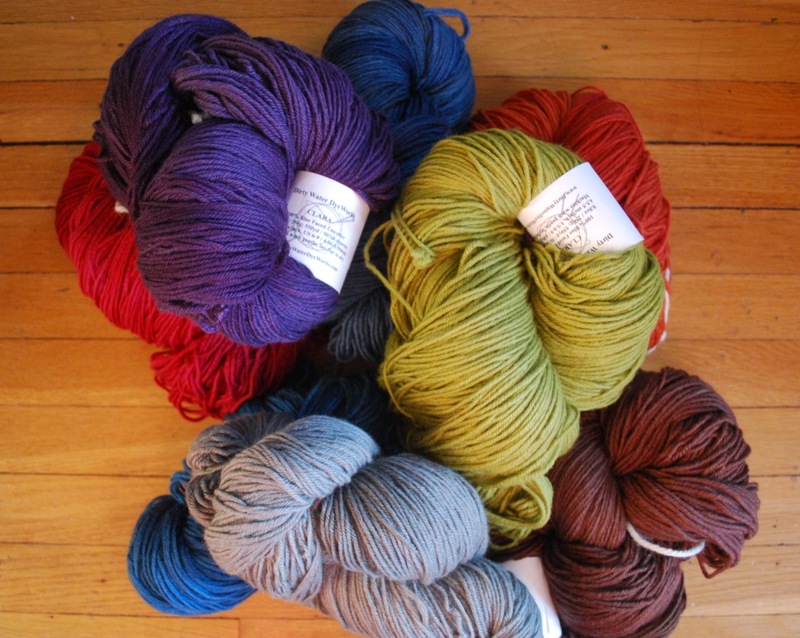 This yarn is soft and lustrous with just a hint of a halo. This base takes dye beautifully and produces rich, deep colorways. Clara is available in large, 250 gram skeins - perfect for bigger projects. Speaking of larger skeins . 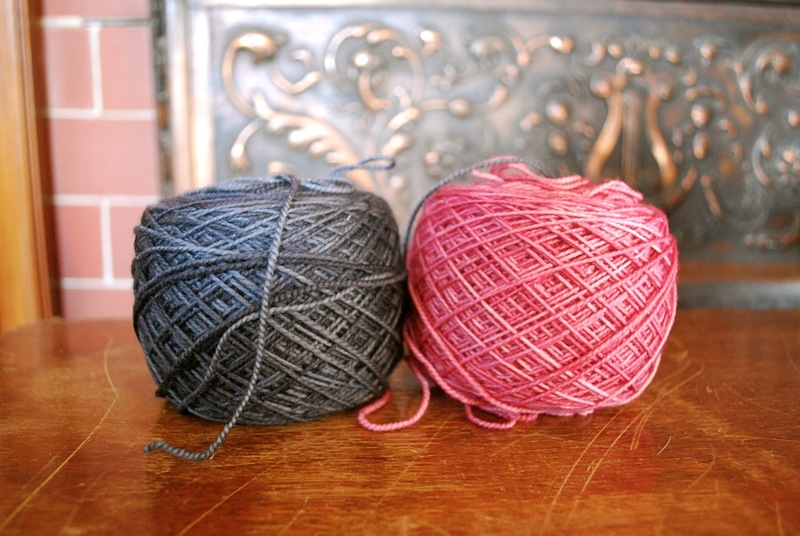 . . for the fall shows I offered Edna Extra - the 250 gram version of the popular Edna yarn. It was so well received that I decided to make it available on the website. This DK weight yarn is a blend of Polwarth wool and silk. 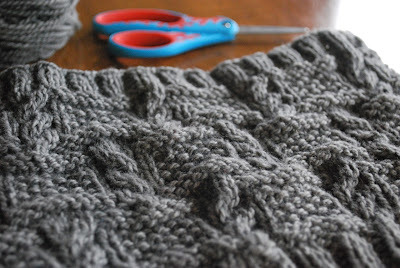 It's a dream to knit and creates a lovely fabric. If you want to keep up with the latest news from Dirty Water DyeWorks and get in on occasional specials, sign up for the newsletter. I promise to keep it short and sweet, and I won't flood your inbox. 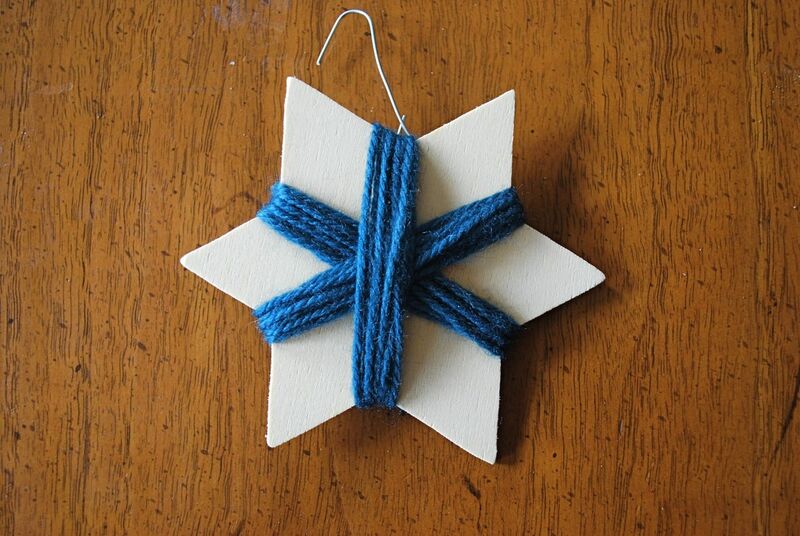 Finally, just a reminder that Dirty Water DyeWorks offers gift certificates, available in any amount. Whether you're shopping for others or making your own wish list, you can't go wrong with a gift certificate. And now I'm off to make up for lost knitting time. Wish me luck. These mitts came off the needles this week and just in time. 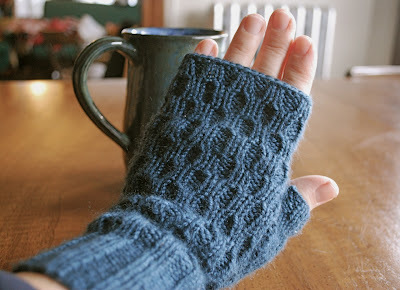 Colder weather is settling in, and I fear I have to return the pair of mitts I borrowed from my daughter. Lacunae Mitts. This is my second Knitspot pattern in a week. Anne Hanson strikes again. Lacunae - from the Latin, air spaces. The name takes me back to high school Latin - a dead language that is still so alive. 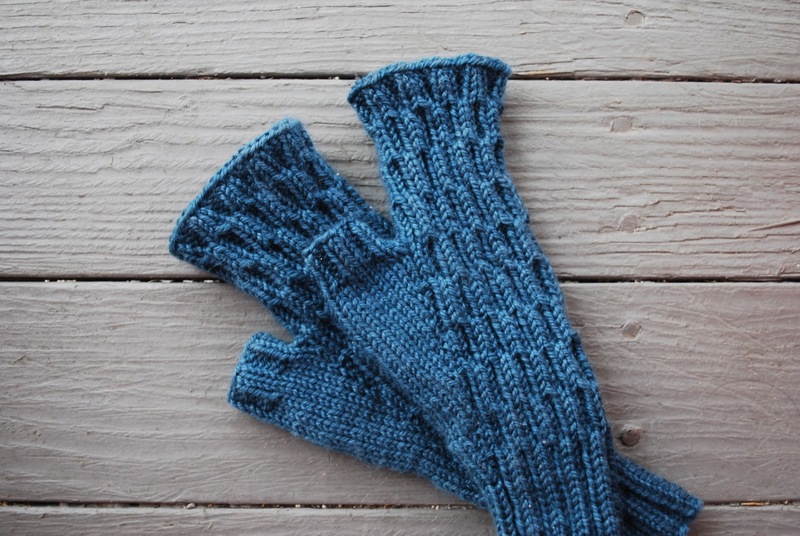 Try on these mitts, and, as if by magic, the air spaces appear. This wonderful little trick is achieved by a clever combination of cables and ribbing. As always Anne's pattern is well-written and includes both charts and written instructions. The yarn is Dirty Water DyeWorks Edna, colorway Moon Shadow. This DK weight blend of Polwarth wool and silk is currently one of my favorites - durable wool with a bit of shimmer. As luck would have it this pattern includes a matching hat. I may have enough leftover yarn to knit the hat. If not, there's more yarn where this came from. It's that time of year. 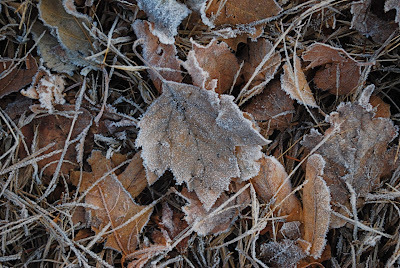 If you're out and about first thing in the morning, you'll see a world transformed by frost. Colors glisten and take on a new hue. I captured this week's color inspiration on one such chilly morning. From black to blue-gray. Magical. Since I'm not traveling any more this year, I've somehow convinced myself that I'll have endless hours of knitting time. For one reason or another my endless hours have evaporated. Or I haven't made the most of my knitting time. Normally I'm well prepared when I head out the door, but yesterday I took leave of my senses when I left with only one knitting project. 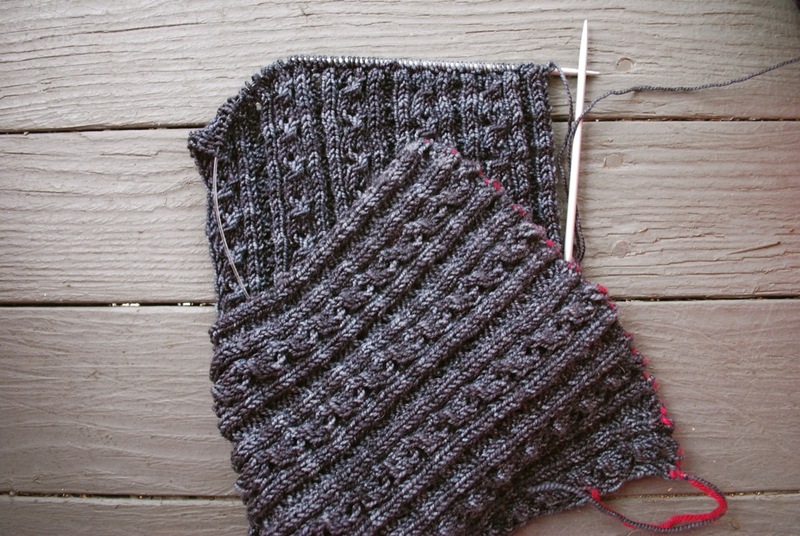 I was on my way to an appointment that was going to be short - in and out without much time for knitting. Instead the appointment went long - very long. At first I wasn't dismayed. 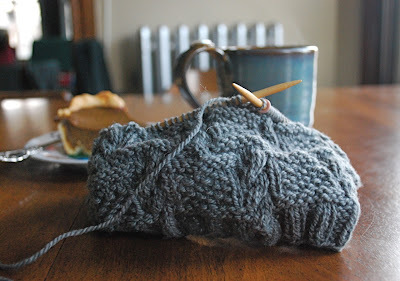 I was a bit irritated when I thought of all the other things that weren't getting done, but I had my knitting. All would be well. I would knit my way through the appointment, and that's just what I did. 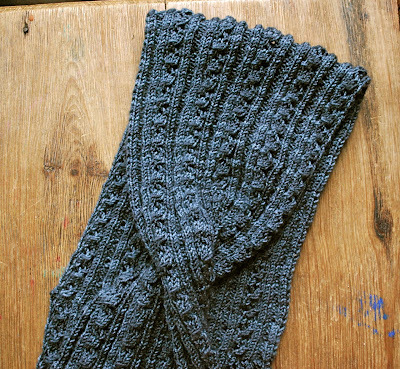 I knit so much I finished the project. And then I had to sit and wait . . . wondering what other people do when they have to wait for appointments and kicking myself for not grabbing that second project. I'm blaming my temporary lapse on the full moon. I did find time for this project over the long weekend. This design has plenty of action without being too complicated - just enough to keep things interesting. And the finished product is full of texture . 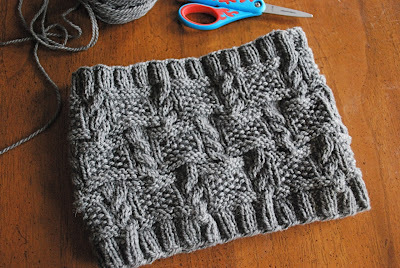 . . tiny cables coupled with moss stitch. I'm in the process of sampling this yarn base - a DK weight organic merino. So far I'm loving it. It's soft and squishy . . . it might be a keeper. To complete the test run I'm going to be wearing this cowl, but I might have to make a couple more. 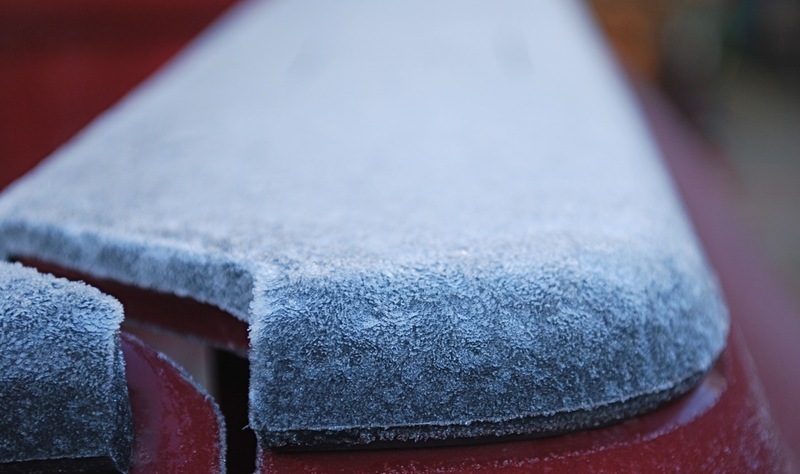 Just in time for wintery weather, just in time for holiday gifting.